Allen J. Christenson first discovered chiasmus in K’iche’ Maya texts in the 1980s.3 Christenson found chiasmus present in several colonial-era Maya documents, including some elaborate examples in the Popol Vuh, which is “by far the most important K’iche’ document to have survived.”4 Other native Maya documents using chiasmus include Título C’oyoi, a native ritual drama called Rabinal Achi, and the Annals of the Cakchiquels (the K’iche’s biggest rivals). The face of the earth has not yet appeared. Alone lies the expanse of the sea, along with the womb of all the sky. There was not yet anything gathered together. All is at rest. Nothing stirs. All is languid, at rest in the sky. There is not yet anything standing erect. Only the expanse of the water, only the tranquil sea lies alone. There is not yet anything that might exist. These are the titles of the people. 13.0.0.0.0, 4 Ahau 8 Cumku, the Creation Event took place. 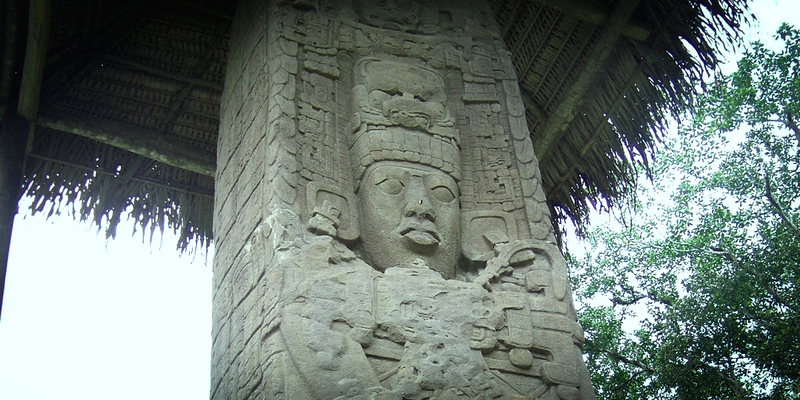 it was the Jaguar Throne Stone. it was the Snake Throne Stone. Using chiastic analysis as a tool has yielded several worthwhile results in the study of Maya literature. In terms of dating, the presence of chiasmus in colonial Maya manuscripts is commonly taken as evidence of a pre-Columbian background or origin of those texts. Since the Book of Mormon purports to be a religious document from pre-Columbian America, comparing how chiasmus is used by both Book of Mormon and Maya authors can be fruitful. Robert F. Smith, “Assessing the Broad Impact of Jack Welch’s Discovery of Chiasmus in the Book of Mormon,” Journal of Book of Mormon Studies 16, no. 2 (2007): 69–71. Allen J. Christenson, “Chiasmus in Mayan Texts,” Ensign, October 1988, online at lds.org. Allen J. Christenson, “The Use of Chiasmus in Ancient Mesoamerica” (FARMS Preliminary Report, 1988). 1. See John W. Welch, ed., Chiasmus in Antiquity: Structures, Analyses, Exegesis (Hildesheim, GER: Gerstenberg Verlag, 1981; reprint Provo, UT: Research Press, 1999). 2. For investigations into various Mayan poetic techniques, including chiasmus, see Kerry M. Hull and Michael D. Carrasco, eds., Parallel Worlds: Genre, Discourse, and Poetics in Contemporary, Colonial, and Classic Maya Literature (Boulder, CO: University Press of Colorado, 2012). 3. Allen J. Christenson, “The Use of Chiasmus by the Ancient Maya-Quiché,” Latin American Indian Literatures Journal 4, no. 2 (1988): 125–150. See, more recently, Allen J. Christenson, “The Use of Chiasmus by the Ancient K’iche’ Maya,” in Parallel Worlds, 311–336. These findings were briefly reported to LDS audiences in Allen J. Christenson, “Chiasmus in Mesoamerican Texts,” in Reexploring the Book of Mormon: A Decade of New Research, ed. John W. Welch (Provo, UT: FARMS, 1992), 233–235; Allen J. Christenson, “Chiasmus in Mayan Texts,” Ensign, October 1988, online at lds.org. See also John L. Sorenson, Mormon’s Codex: An Ancient American Book (Salt Lake City and Provo, UT: Deseret Book and Neal A. Maxwell Institute for Religious Scholarship, 2013), 445–448. 4. Christenson, “Use of Chiasmus by the Ancient K’iche’,” 320. For more on the use of parallelism and chiasmus in the Popol Vuh, see Allen J. Christenson, trans. and ed., Popol Vuh: The Mythic Sections—Tales of First Beginnings from the Ancient K’iche’ Maya (Provo, UT: FARMS, 2000), 12–18, esp. 15–17; Allen J. Christenson, trans., Popol Vuh: The Sacred Book of the Maya (Norman, OK: University of Oklahoma Press, 2007), 42–49, esp. 46–47. See also Luis Enrique Sam Colop, “Poetics in the Popol Wuj,” in Parallel Worlds, 283–309. Christenson has also provided translations of the Popol Vuh that display the text in its chiastic and parallel forms. See Christenson, Mythic Sections, 137–271; Allen J. Christenson, trans., Popol Vuh: Literal Poetic Version (Norman, OK: University of Oklahoma Press, 2007). 5. For the most complete report of his findings, see Allen J. Christenson, “The Use of Chiasmus in Ancient Mesoamerica” (FARMS Preliminary Report, 1988). See also Christenson, “Use of Chiasmus by the Ancient K’iche’,” 311–336. 6. Christenson, “Use of Chiasmus by the Ancient K’iche’,” 328, 311. 7. Kerry Michael Hull, Verbal Art and Performance in Ch’orti’ and Maya Hieroglyphic Writing (PhD diss., University of Texas, 2003), esp. 175–178, 297–301; Danny Law, “Poetic Style in Colonial Ch’olti’ Mayan,” Latin American Indian Literatures Journal 23, no. 2 (2007): 142–168. 8. Nicholas A. Hopkins and J. Kathryn Josserand, “The Narrative Structure of Chol Folktales: One Thousand Years of Literary Tradition,” in Parallel Worlds, 29. See also Lydia Rodríguez, “From Discourse to Thought: An Ethnopoetic Analysis of Chol Mayan Folktale,” Signs and Society 4, no. 2 (2016): 295–296. 9. Gretchen Whalen, “The Power of the Paradigm: Continuity in Yucatec Maya Narrative,” paper delivered at the 1997 meeting of the Latin American Studies Association (April 17–19, 1997), 12; Charles Andrew Hofling, “A Comparison of Narrative Style in Mopan and Itzaj Mayan,” in Parallel Worlds, 403, 409–410. 10. R. Jon McGee, “Palenque and Lacandon Maya Cosmology,” Texas Notes on Precolumbian Art, Writing, and Culture 52 (March 1993): 1–8. Diane E. Wirth, Parallels: Mesoamerican and Ancient Middle Eastern Traditions (St. George, UT: Stonecliff Publishing, 2000), 190 cites a symposium presentation by McGee where he reportedly said that Lacondon chiasms generally average about 10 lines in length, though some are as long as 60–100 lines. 11. Michela Craveri and Rogelio Valencia, “The Voice of Writing: Orality Traces in the Maya Codices,” in Tradition and Innovation in Mesoamerican Cultural History: A Homage to Tatiana A. Proskouriakoff, ed. Roberto Cantú and Aaron Sonnenschein (Munich, Ger: Lincom Europa, 2011), 100–103. 12. See Nikolai K. Grube, “Dresden Codex,” in The Oxford Encyclopedia of Mesoamerican Cultures: The Civilizations of Mexico and Central America, 3 vols., ed. Davíd Carrasco (New York, NY: Oxford University Press, 2001), 1:337–339; Gebrielle Vail, “Madrid Codex,” in Oxford Encyclopedia of Mesoamerican Cultures, 2:143–146. 13. Hull, Verbal Art, 455–456, 480–481. 14. Hutch Kinsman, “Grammar in the Script: Literary and Visual Devices in Grammatical Constructions,” The Codex 17, no. 3 (2009): 44. 15. J. Kathryn Josserand, “The Missing Heir at Yaxchilán: Literary Analysis of a Maya Historical Puzzle,” Latin American Antiquity 18, no. 3 (2007): 295–313. On the ten-year gap and possible explanations for its existence (plus mention of another candidate ruler during this time), see Ruth J. Krochock, “Written Evidence,” in Lynn Foster, Handbook to Life in the Ancient Maya World (New York, NY: Oxford University Press, 2002), 289–290; Simon Martin and Nikolai Grube, Chronicle of the Maya Kings and Queens, 2nd edition (New York, NY: Thames and Hudson, 2008), 127. 16. Michael D. Carrasco, “The History, Rhetoric, and Poetics of Three Palenque Narratives,” in Parallel Worlds, 131, 139, 148, 151. See also J. Kathryn Josserand, “The Narrative Structure of Hieroglyphic Texts at Palenque,” in Sixth Palenque Round Table, 1986, ed. Virginia M. Fields (Norman, OK: University of Oklahoma Press, 1991), 27. 17. J. Kathryn Josserand and Nicholas A. Hopkins, Maya Hieroglyphic Writing: Workbook for a Short Course on Maya Hieroglyphic Writing, 2nd edition (Tallahassee, FL: Jaguar Tours, 2011), 18–21. See also Kinsman, “Grammar in the Script,” 37–38; Robert F. Smith, “Assessing the Broad Impact of Jack Welch’s Discovery of Chiasmus in the Book of Mormon,” Journal of Book of Mormon Studies 16, no. 2 (2007): 69–71. 18. Kerry M. Hull, “Poetic Tenacity: A Diachronic Study of Kennings in Mayan Languages,” in Parallel Worlds, 73. 20. Christenson, “Use of Chiasmus by the Ancient K’iche’,” 318. This is typical of parallelism in most cultures around the world. 21. Carl Cranny, “The Deliberate Use of Hebrew Parallelisms in the Book of Mormon,” Journal of Book of Mormon Studies 23 (2014): 140–165. 22. Christenson, “Use of Chiasmus by the Ancient K’iche’,” 332. As Christenson pointed out (pp. 312–313) this was also a common use of chiasmus in Greek and Latin literature. 23. See 1 Nephi 15:7–12, 24–25, 33–34; 16:1–3; 17:17–20, 46, 48–52 in Donald W. Parry, Poetic Parallelisms in the Book of Mormon: The Complete Text Reformatted (Provo, UT: Neal A. Maxwell Institute for Religious Scholarship, 2007), 31–35, 39, 41–42. 24. Terryl L. Givens, “The Book of Mormon and Dialogic Revelation,” Journal of Book of Mormon Studies 10, no. 2 (2001): 16–27; Terryl L. Givens, By the Hand of Mormon: The American Scripture that Launched a New World Religion (New York, NY: Oxford University Press, 2002), 209–239. 25. Terryl L. Givens, “The Book of Mormon and Dialogic Revelation,” 21; Terryl L. Givens, By the Hand of Mormon, 222. Givens is drawing on the chiastic structure as laid out in John W. Welch, “Chiasmus in the Book of Mormon,” in Chiasmus in Antiquity, 199–200. 26. Christenson, “Use of Chiasmus by the Ancient K’iche’,” 333. 27. Hull, “Poetic Tenacity,” 74. 28. Christenson, “Use of Chiasmus by the Ancient K’iche’,” 329–331. 29. See John W. Welch, “Parallelism and Chiasmus in Benjamin’s Speech,” in King Benjamin’s Speech: “That Ye May Learn Wisdom,” ed. John W. Welch and Stephen D. Ricks (Provo, UT: FARMS, 1998), 315–410. See also Parry, Poetic Parallelism, 159–172. 31. See Neal Rappleye, “‘The Things Which my Father Saw’: The Chiastic Inclusio of 1 Nephi 11–14,” at Studio et Quoque Fide: A Blog on Latter-day Saint Apologetics, Scholarship, and Commentary, May 9, 2015, online at studioetquoquefide.com. In biblical studies, envelope structures are referred to as inclusio. 32. See Parry, Poetic Parallelism, 165–166 for the chiastic structure of Mosiah 3:11–16. Another possible example where the chiastic structure is framed by an “envelope chiasmus” is 2 Nephi 25:24–27. See Welch, “Chiasmus in the Book of Mormon,” 202. However, Parry, Poetic Parallelism, 112 structures this passage differently so that it does not feature an envelope chiasm. Also, Joseph M. Spencer, An Other Testament: On Typology, 2nd edition (Provo, UT: Neal A. Maxwell Institute for Religious Scholarship, 2016), 2–7 argues that Alma 36:1–5, 26–30 forms an “envelope chiasm” although he does not use that term. 33. For the chiastic structure of Alma 29 see Parry, Poetic Parallelism, 298. Mosiah 3:1–3 (awake/awoke/awake) and Helaman 6:21–26 (brother/brother/brother) also feature triplets in the center, though they are simpler. See Parry, Poetic Parallelism, 164, 406–407. 34. See, for example, the couplet discussed in Kerry M. Hull, “War Banners: A Mesoamerican Context for the Title Liberty,” Journal of Book of Mormon Studies 24 (2015): 114–117. 35. Michael D. Carrasco and Kerry M. Hull, “Introduction,” in Parallel Worlds, 1.